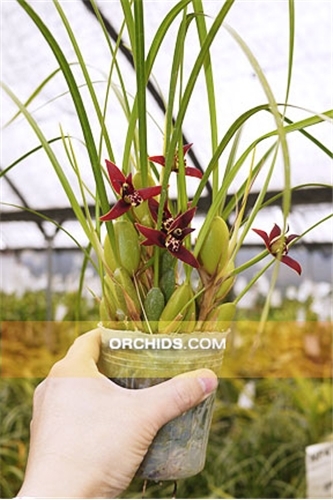 Maxillaria tenuifolia is one of those orchids that belongs in every collection. The grasslike foliage makes an attractive housplant even when not in flower. Fantastic fragrance! It smells like dark chocolate with coconut. Flowers are about 1.5 inches in size held close to the main stem of the plant. They grow for us outside in southern California all year (32 to 98 F degree), and bloom most of the time during warm summer months. Grows like weed.